University Libraries presents the 31st Annual Nevada Writers Hall of Fame Tuesday, Nov. 13, at 7 p.m. in the Milt Glick Ballroom, 4th floor, at the Joe Crowley Student Union on the University of Nevada, Reno campus. The event’s general reception will begin at 6:30 p.m. with the formal program beginning at 7 p.m. The cost to attend is $40 per person. Tickets can be purchased online by visiting: http://bit.ly/NWHOF2018. 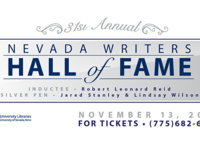 The 2018 Nevada Writers Hall of Fame inductee is Robert Leonard Reid. The 2018 Silver Pen recipients are Jared Stanley and Lindsay Wilson. For event sponsorship information, or general questions regarding the 2018 Nevada Writers Hall of Fame please contact Robin Monteith, University Libraries’ assistant director of development, 775-682-5656, or via email at robinmonteith@unr.edu.